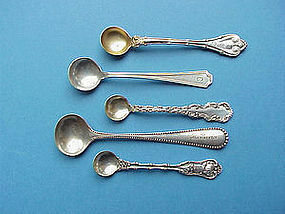 An assortment of individual (and two master) salt spoons. Pictured here top to bottom: Whiting EMPIRE monogrammed "L.M." and engraved "Cincinatti" (reverse), SOLD; Durgin FAIRFAX monogram "C" 18.00; four Whiting LOUIS XV no monogram SOLD; Watson PLYMOUTH master salt three inches engraved "The Rocks" (For once I am without comment) $25.00; five Whiting IMPERIAL QUEEN monogram "D" $24 each. 99 percent of the salt spoons on the market these days are knockoffs made by a company in Connecticut, but these are all original and bear the manufacturer's trademark clearly struck.